Culpeper County-based online grocer The Fresh Harvest and Powell Wellness Center have partnered to provide area residents with easy access to locally grown food. The Culpeper community can now order from the virtual farmer’s market and pick up orders at Powell Wellness Center, located at 1005 Golf Drive in Culpeper. Fresh Harvest orders can be picked up at Powell every Friday from 4:00-6:00 pm. Formed in 2017, the Fresh Harvest serves as a virtual farmers’ market to connect small local producers and consumers. The Fresh Harvest currently serves Culpeper, Warrenton, Charlottesville, and Loudoun County. Visit www.thefreshharvest.com to browse locally-grown foods online, place an order with one click, and select a convenient pick-up or delivery option. 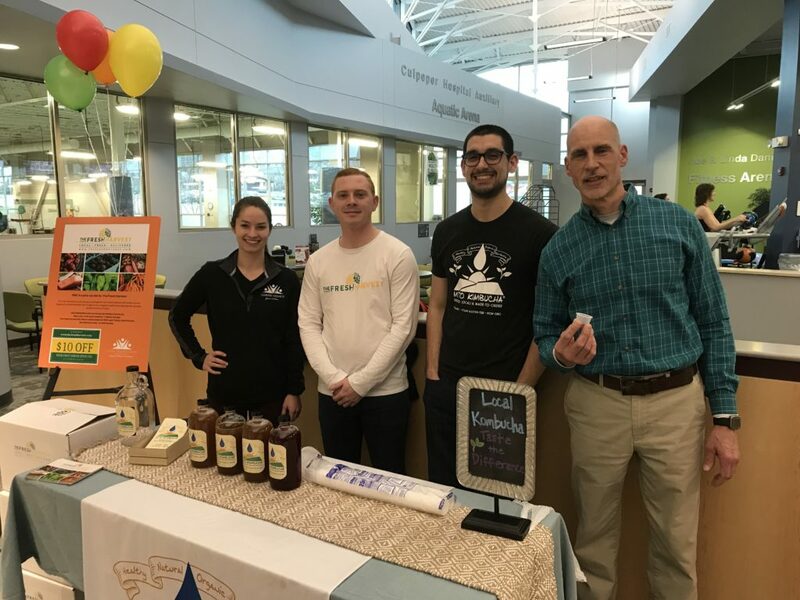 PWC medical program leader Whitney Propps, Matt Coyle of The Fresh Harvest, Greg Sidote of MTO Kombucha, and PWC director Eric Good at PWC during a “Fresh Harvest Friday” at PWC.